Yay for satsuma season! You know that winter is just around the corner when these little balls of orangy goodness start appearing all over the place. And is it just me or do you associate satsumas with Christmas? Maybe because I always found a lone satsuma lurking in the toe of my stocking on Christmas morning (thank mum!). It usually sat discarded amongst all the chocolate coin wrappers until New Years when I snuck it back into the fruit bowl (sorry mum!). Thankfully my tastebuds have developed since those days and I now very much appreciate these bursts of Vitamin C on a cold and wintery day. However trying to convince my fussy eater that they are an exciting and tasty snack is another story so I decided to spruce up the humble satsuma with my favourite ingredient….chocolate! I used 70% cocoa chocolate in this recipe in order to keep the sugar content as low as possible. 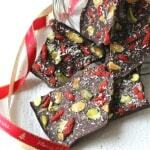 But you could use a lower percentage chocolate to get the kids more used to the darker taste. I find that the coconut oil also helps to sweeten the chocolate a little and gives it just a very subtle coconut taste. If you are short on time you can just dip the satsumas once in the chocolate but dipping them twice gives a much thicker coating. 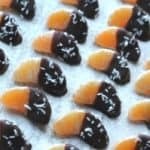 Sorry to mention the “C” word again when it’s still November, but I think these satsumas make the perfect snack for after school or to tackle that mid afternoon work slump. Lets face it, we all over-indulge a little (or a lot!) in December so having some healthy and nutritious snacks to hand will help balance out all those extra Christmas treats! 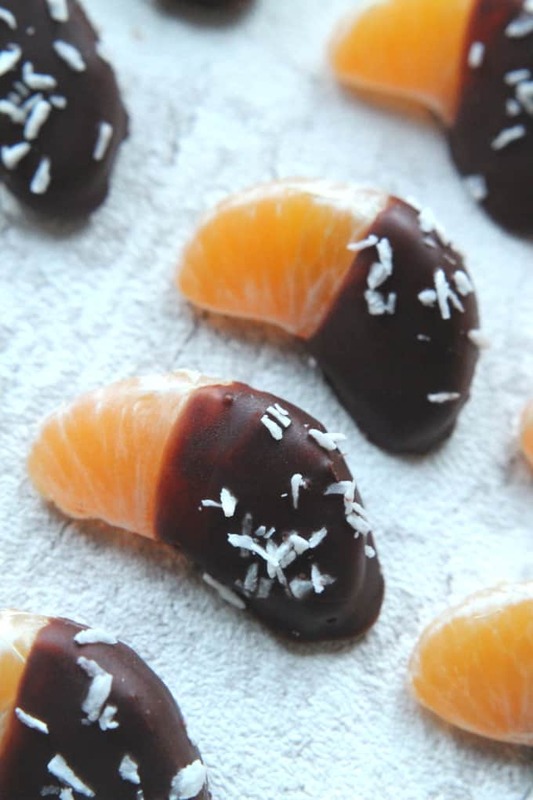 Satsumas dipped in chocolate and coconut oil and sprinkled with desiccated coconut. 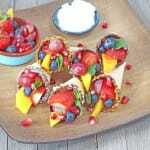 A healthy, low sugar snack for kids and adults alike! Peel the satsumas and separate into segments. Melt the chocolate and coconut oil together in a saucepan over a low heat. Stir continuously until everything has melted and is well combined. Be sure not to burn the chocolate. Remove from the heat. Dip each satsuma segment into the melted chocolate and place on a plate or baking tray. Once all the segments have been dipped, place the tray in the fridge for 5 minutes to allow the chocolate to set. Remove from the fridge and dip each segment in the chocolate a second time and then immediately sprinkle on some desiccated coconut. Return to the fridge for a further 5 minutes. 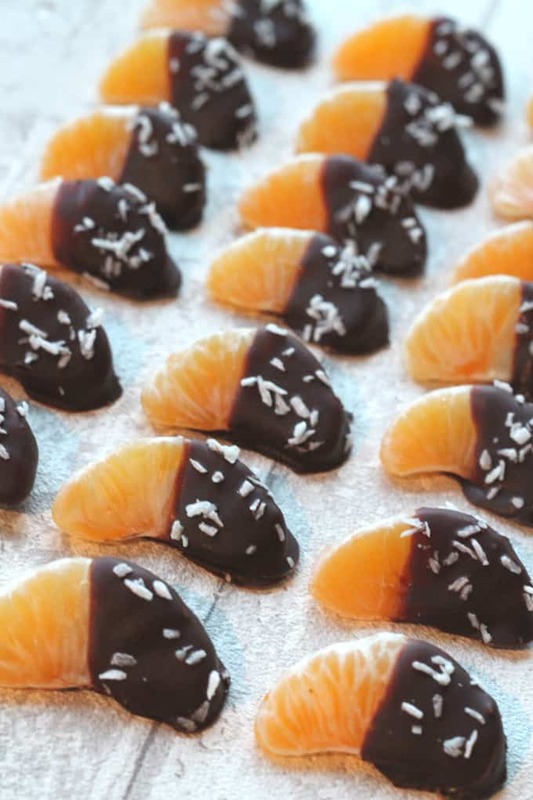 These Chocolate Dipped Satsumas will keep in the fridge for a couple of days, it is best to eat them within 24 hours as they will begin to dry out. Oh my god, I absolutely love these!!! The chocolate goes so well with the satsumas and it’s definitely a more enticing way to eat fruit! Hi Dorothy, I don’t have a problem at all with people pinning my recipes. In fact Im grateful when they do. But unfortunately another blogger has taken a lot of my recipes pins and has changed the url so that they re-direct to her site rather than mine. 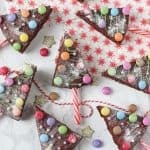 I reported this to pinterest but they have no taken down ALL the images of this recipe rather then just the one that the blogger was re-directing to her site. I have emailed them and hopefully they will be re-instating the valid pins shortly. Thanks! We have mandarins too. Mandarins / Satsumas / Clementines are all interchangeable in the UK! You are so rigt – satsumas are definitely a sign of winter. Do try it Josefine. They are good! !